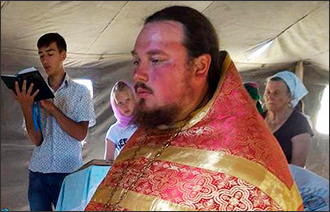 In the village of Merke (Zhambyl region of Kazakhstan) on 14 August, Vladimir Vorontsov, the rector of the parish of the Nativity of the Most Holy Mother of God Church, stood the first trial. An anonymous tip-off reported police that he, along with children from the Orthodox group of the weekend (Sunday school) and several parents conducted prayer meetings in the mountains. The children and their parents had recreated for ten days in the mountains while meeting and praying in the camp tent. But on 2 August, representatives of the local administration, the police and members of the National Security Committee (KNB) invaded the camp for inspection. Initially, the priest was rudely accused of extremism, detaining children illegally and smuggling religious literature. The operatives tried to interrogate the children. And only a call to the deputy head of the regional administration slowed down the ardour of the enforcers and officials and they left, allowing the camp participants to continue their vacation. However, two days later a protocol outlining his administrative violation reached Vorontsov and on 6 August the court summoned him charging of religious meetings held in inappropriate places. Under the law on religious activities, any rituals can be held only in specialised places for worship. For this reason, religious minorities - Protestants, Krishna worshippers, separate Muslim groups - are systematically subjected to fines or administrative arrests, even for the joint reading of the Bible or prayers in apartment buildings. But until now, representatives of Orthodoxy, considered as one of the traditional religions for Kazakhstan, have not been subjected to any persecution related to religious activities. The priest hopes that the voice of reason will win the judges. “This case caused a painful reaction among parents of children and the Orthodox community. Many are indignant and consider that this is oppression on the national and religious grounds. I am trying to explain to people that this is not so, just the authorities misunderstood the law. The public reaction started, today I had a call with the Consul General of the Russian Federation, whom our parishioners complained. I told him everything as it is, he was very surprised and promised to render his support. But I still rely on the laws of my country. I am preparing, consulting with lawyers and on 14 August I am going to defend my rights to the end in court,” Vorontsov said. 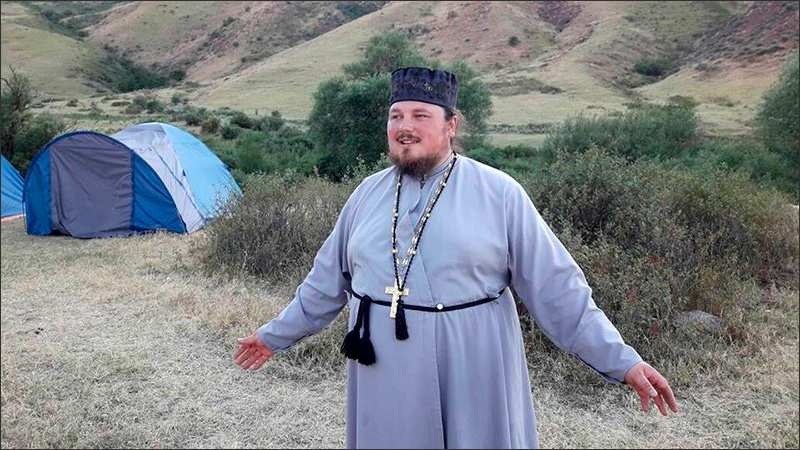 There is no official reaction of the Metropolitan (Bishop) District of the Russian Orthodox Church in Kazakhstan about the incident with Vladimir Vorontsov. “The Metropolitan watches the situation and supports me. But so far he has made no official statements,” the priest told Fergana News Agency. The Union of Orthodox Citizens claimed Law on Religious Activity and Religious Associations was violated in respect of Vladimir Vorontsov and demanded to draw back all charges that do not comply with Kazakhstan's legislation. "Recently, I had to write a lot of unpleasant things. God knows I did not want this. I had to defend myself. I wrote poetry in July. God willing, I will soon be able to show them to you. The Lord visited me with creative inspiration, and I wrote a number of wonderful vers libre. I even thought that God gave me a new poetic collection. But on 2 August local executive authorities and law enforcement agencies interfered in my life. They tried to destroy my inner world. They failed. But, alas, I am not writing poetry these days, I am writing these unpleasant texts about unscrupulous officials, writing complaints and statements," the priest said on his Facebook page. 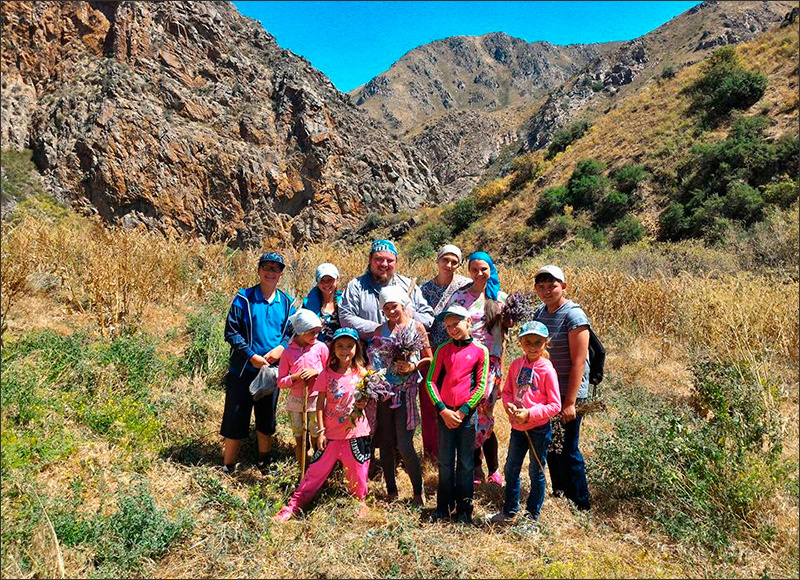 Previously, the most famous conflict between the authorities of Kazakhstan and the Orthodox Church involved the activities of a children orphanage and the refuge for elderly near Alma-Ata, started by Father Superior Sofrony, a Russian citizen. Initially, there was a version that someone from the power structures put an eye on the estate territory located next to the lake. However, after Father Sofrony was forced to leave everything and leave Kazakhstan, the authorities left the shelter in peace. In June 2017, the President of Kazakhstan, Nursultan Nazarbayev, decided to approve the Concept of State Policy in the Religious Sphere of the Country for 2017-2020. Interfax reported its content saying that, as of 1 January 2017, there are 3,658 religious associations and their branches representing 18 denominations registered in the country. The most numerous among them are the Islam of the Hanafi mazhab and Orthodox Christianity. There are also Catholic, Protestant, Jewish, Buddhist and other communities. 3,464 religious buildings registered in the republic, including 2,550 mosques, 294 Orthodox and 109 Catholic churches, 495 Protestant churches and prayer houses, seven synagogues, two Buddhist temples, seven prayer houses for the "Society for Krishna Consciousness" and the Baha'i community. Operating mosques are the property of the Spiritual Administration of Muslims of Kazakhstan. The Orthodox Church of Kazakhstan has the second largest number of followers. It includes 325 religious entities, including 301 parishes, nine dioceses and 294 religious buildings, as well as the Metropolitan district in Kazakhstan. Other Orthodox churches include the Armenian Apostolic Church, the Russian Orthodox Church Abroad, the Pomor Orthodox Church and three Old Believer church on the territory of the republic. The Catholic Church in Kazakhstan is represented by 85 religious communities, five of them belong to the Greek Catholic Church. There are 667 Protestant religious subjects in the country, the largest of them are the churches of Pentecostals, Evangelical Christians-Baptists, Presbyterians, Seventh-day Adventists and Lutherans. There are also 531 missionaries registered - in total, they represent 13 religious directions. Among registered missionaries are representatives of the Roman Catholic Church - 257 - are predominant. Orthodoxy is represented by 84 missionaries, the majority - citizens of Russia. Along with this, 15 religious educational organisations operate in Kazakhstan, 400 primary courses with mosques and Sunday schools, 383 premises for religious activities outside the religious buildings, including prayer rooms and chapels. There are also 257 special stationary rooms for the distribution of religious literature and religious items.